Thursday at the Wyandotte County Fair – Welcome to Wyandotte Daily! Free concert: 8 p.m., Big Dave, Free Stage. Helicopter rides: 5 p.m.-10 p.m. Thursday and Friday, and Saturday from opening to close. $40 cost. Hedrick’s Petting Zoo and Camel Rides: 5-10 p.m.
Hedrick’s Pig Races: 6, 7 and 9 p.m.
Free Magic Show: 5:p.m. and 7 p.m., Red Barn. 4-H Round Robin Judging: 7 p.m.
Carnival: 5-10 p.m. Carnival wristbands at $25. Other attractions: 4-H exhibits, open exhibits, vendors’ booths, military vehicle displays, bounce house and more. Fair hours: 5 p.m. to 10 p.m. Location: 13700 Polfer Road, Kansas City, Kansas. East of K-7 on Polfer Road. 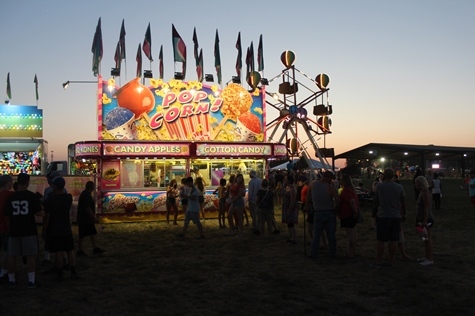 Dates: The Wyandotte County Fair continues now through July 14. Refreshments: Those attending the fair may bring in one bottle of water. Food and refreshments are available for purchase. More information: Check with the fair’s Facebook page and website, https://www.facebook.com/Wyandotte-County-Fair-663607383718211/ and https://www.wycofair.com/. 4-H information is at https://www.facebook.com/WyCo4H/.